This Wallace Continental Hammered 78-Piece Flatware Set features striking handles that are textured with gleaming hammered dents, giving it a ruggedly metropolitan appeal. 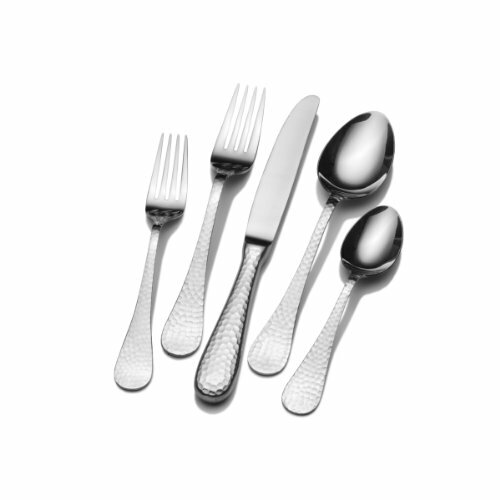 Constructed of superior quality 18/0 stainless steel, this set is ideal for everyday use as well as formal occasions. 78-piece set, service for 12, includes 12 each of: dinner fork, salad fork, dinner spoon, teaspoon and dinner knife. Also includes 12 additional teaspoons, plus 1 each of: serving tablespoon, pierced tablespoon, cold meat fork, butter serving knife, sugar spoon and pie server. Dishwasher safe.